I wanted to share Blue Sky Scrubs with my neighbors here At the Fence! Blue Sky scrubs has all the scrubs you would ever need! Now, I personally love wearing scrubs as tops, and I am not in the medical field at all! Except for taking care of minor cuts, scrapes and bruises at home. With 6 children, I do have some experience at this! I just like them because they are so comfortable. I started wearing them years ago when my husband was a dental tech. I had to wash them, and just decided to try wearing a scrub top one day, and I was sold. I loved wearing them to bed, and they work for when you are cleaning house. Blue Sky Scrubs also carries stretch polos. I have never worn one, but they sure sound nice. Their line contains, jackets, shirts, lab coats, hats, and accessories. 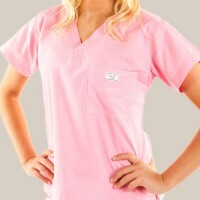 So if you need scrubs, or just want to try them out for comfort, try http://www.blueskyscrubs.com/ . They have so many styles available. And I was amazed to find they carry scrubs for children and babies! My daughter would Love the hot pink scrubs! Do any of you wear scrubs? Let me know! Brought to you by your friends at Blue Sky Scrubs.